I have been on a major Burt's Bees kick these days. I used to use the Burt's Bees skin care way back when I was pregnant with Nick. That's 7 years ago now. I liked, but didn't love the facial products. Burt's Bees has come a long way since then. I hadn't tried their facial products again until a few months back. 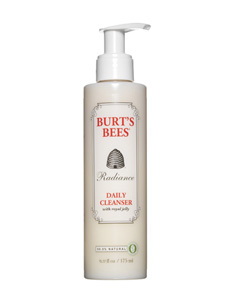 If you're a regular reader, you'll know that I am really loving the Burt's Bees Radiance Facial Cleanser. It is ultra gentle, but it also works to exfoliate the skin with a multi-fruit acid complex. It contains the same blend of fruit and sugar enzymes (sold through suppliers as "Multifruit") that I used to use in my Fruit Enzyme Facial Cream that I made. It also has royal jelly, which I love in skin care. I have had a pretty set routine these months--the Radiance Cleanser, Thayer's Alcohol Free Rose Petal Witch Hazel Toner, Avon Ultimate Age Repair Cream SPF 25, Derma E Tropical Solutions Anti-Aging Night Cream, Avon Clinical Eye Lift, and an antioxidant serum from Juice Beauty. A few weeks back, I started to change up parts of that regimen. First of all, my night cream started making my skin break out after I had gotten about 1/2 way through the jar. I also liked the Juice Beauty serum, but it really is overpriced (in my opinion). I also really like the Avon Clinical Eye Lift's new version, but I guess I am always on the quest for something that could be better. I now, for the time being at least, have found some really great replacements. I have been using these for about a month with great results! I find that my skin does change seasonally, so I may need a bit more moisture as we get to fall and winter. 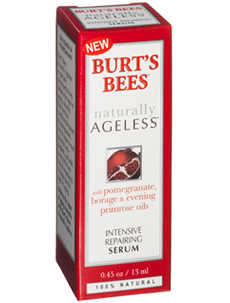 I have been using 2 more products from Burt's Bees that I simply adore. They are from their pomegranate-based Naturally Ageless line and they work well and are ultra gentle. I also will preface this by saying I have been getting mine on eBay. They are new and boxed from sellers with great feedback, but they are 50-60% less in cost than you'll pay on the Burt's Bees site. Just do a search and you'll find some good deals. If you're hesitant to try, Target often has good deals on Burt's Bees. The first one I will recommend is the Line Smoothing Eye Cream. It retails for $25. I got mine on eBay for just under $10. If you are at all sensitive to scents, this one you may want to bypass. It has a very subtle floral aroma. I wish Burt's would eliminate any type of unnecessary fragrance, but I am thankful that this recipe doesn't bother me at all. 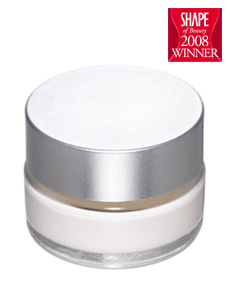 This is a light, semi-cooling eye cream. I can feel it soothe the undereye area. It absorbs right in without leaving a greasy residue, yet it really moisturizes. It contains natural ingredients such as horse chestnut, sunflower oil, olive oil, magnolia bark, pomegranate, evening primrose oil, and more. I really like this one, especially at night. The next product I adore even more. It is the Intensive Repairing Serum. It also retails for $25. I paid $11 on eBay for this one. It is all-natural and just makes my skin feel like silk. You'll find rosehip seed and jojoba as the first two ingredients, followed by so many other wonderful nutrients for the skin. There is antioxidant green tea, calendula, wheat germ oil, and an ingredient I love for skin care--Bulgarian rose oil. This is just lovely. You only need one small drop and it just feels so wonderful. I apply this as my night time treatment product. In the winter, I most likely will need a cream over it. Right now, though, this is perfect on its own. After cleansing and toning, I apply this at night all over and then use the eye cream as well. Compared to the Juice Beauty serum, I actually prefer the texture of this one once more. I also like how my skin feels when I wake up in the morning. I am a big proponent of natural facial care products and am so happy that Burt's Bees has been meeting most of my skin's needs. I still prefer the Thayer's Rose Petal Toner and I like the peptides and SPF I am getting from the paraben-free Avon day cream. Otherwise, Burt's Bees is my one stop skin care line these days. Speaking of Burt's Bees, the winner of the body wash from Friday's giveaway is Renee B. and she was notified via my Facebook Fans page. Congrats!